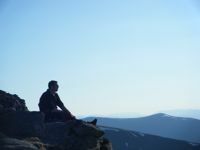 I started the week with Braeriach, reaching the summit five hours after getting off the train. 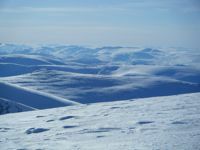 The next day I took a leisurely stroll round the tops of Cairngorm's northern corries with a mate. 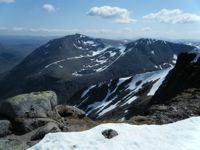 On Wednesday I climbed Beinn Mheadhoin (my no.1 target for 2011). 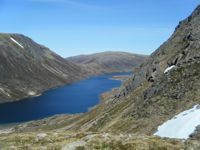 Yesterday, I walked over the Moor of Feshie to Loch an Eilean, but forgot my camera. Gutted. Today I was going to climb Cairn Toul from Glen Feshie, but it's gusting 60mph with patchy showers and cloud on the tops. Weather situation now normal. It's time for a day in the coffee shop with my book. 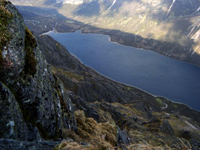 Addendum: by lunchtime, the tops were clear and from my seat in the coffee shop, I was being summoned up Sgòran Shu Mor. 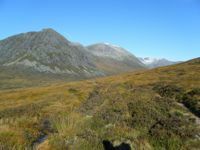 I didn't set off until 3.30pm, but had six fantastic hours on the Glen Feshie ridge. So glad it's been good for you for a few days at least! It's definitely a year for mountains. Lovely photos. I've been so lucky. Now had five days walking, almost all of it in sunshine. Strong winds today, but only one passing shower!